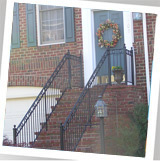 R & F Metals has been serving contractors and builders in the Washington DC Metro area with railing and fencing for over 30 years. Our products are custom made for each order. We manufacture all of our railings and fencing at our facilities. We use design and layout software to help with your project. This allows us to reduce the time it takes and eliminate errors during the fabrication process. We offer 8 typical designs, or we can custom design and build for a really unique look. R & F also offers supply and miscellaneous fabrication for a variety of steel items.